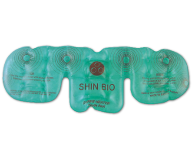 Shin Bio products come in many convenient sizes. All prices are in Australian dollars and include GST. 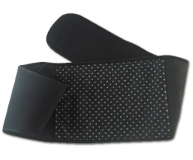 Containing dehydrated ceramic stones, the Ceramic Stone Belt comes in a lightweight Velcro pouch that hugs the painful area. 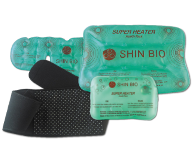 Used in conjunction with the Large Heat Pack the Ceramic Stone Belt can conduct heat up 40mm deeper into your skin. 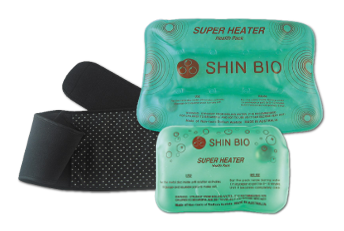 Like the Bio Ceramic Stone Belt Large, the Bio Ceramic Stone Belt Medium maximises heat from the Heat Packs. 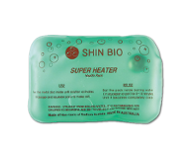 Its smaller size is perfect for applying heat to joints eg: wrists, elbows, knees and ankles. 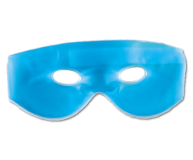 The Cooling Eye Mask offers soothing cool. 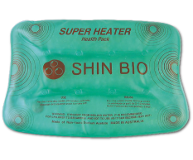 It does not have the heating abilities of the Heat Packs. Place the eye mask in the refrigerator for 30 minutes to an hour, and then place over your eyes. 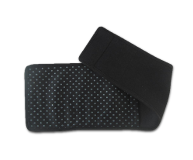 Includes a Large and a Small Heat Pack along with a Large Ceramic Stone Belt. 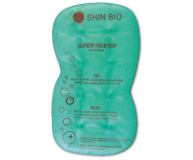 Includes a Triple, a Large and a Small Heat Pack along with a Large Ceramic Stone Belt. 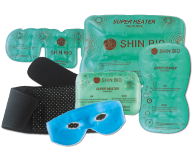 Includes a Triple, a Large, a Medium and a Small Heat Pack, the Cooling Eye Mask and both Ceramic Stone Belts.